7.17 points at 30 votes (rank 310). 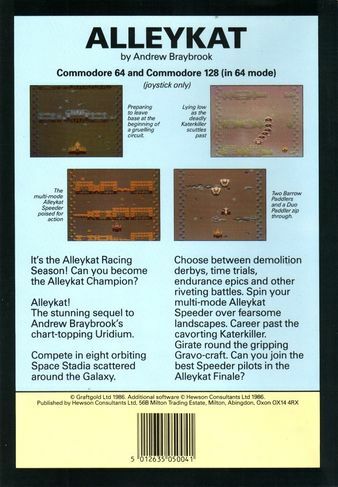 Alleykat is a mixture of a shooter and a racing game. You can choose from a list of races, in which you want to take part; the features of the tracks can be viewed as well as the corresponding participation fee and the prize. The tracks differ heavily - on some parcours you can find obstacles, which can be shot easily, on other tracks you have to stay on the given path. 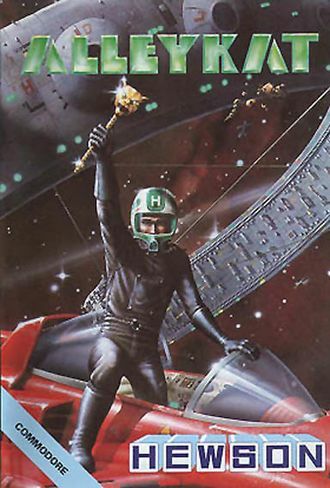 During the race shooting enemies appear constantly. If you get hit or you touch an obstacle you lose energy, which can be filled up by collecting energy cells. The game is over if you can't afford participating in another race. The two player mode is cooperative. The participation fee is double paid from the shared account and the race is run by both players one after the other. Alleykat is one of the first games, which use raster line interrupts intensively, to realize multicoloured writing etc., which catches the eye especially on the title screen and is very nice to look at. Very positive is the absolutely judder free and fast scrolling (the animated images might deceive you). Also the spectacular crashes and the very nicely animated backwards loop need to be mentioned ;-). In the game there is - in contrast to the title screen - no music, just sounds. Press the fire button to start the racing season. You are presented a list of races, which are parted into months. To choose move the joystick forwards or backwards. You can only choose races, of which you can afford the entry fee. Your current money will be shown in the upper part of the screen. At the beginning you don't own any money, but in the first 5 races no entry fee will be needed. If you have moved the race that you want to run into the line of choice for the races, press fire to start. The Alleykat speeder, which is delivered by the organisator of the races, will be brought into position and let off. The computer controlled Gravo Crafts, the landscape and the horrible Katerkiller stand between you and the finish line. When the race is over, you will get rewarded points for the destruction of Gravo Crafts. Some bonus points can be earned for different race types. If you end the race successfully, you will get extra points and the prize money. Now you can choose the next race. The season will be continued until the Alleykat final or until you cannot afford the entry prize for another race. Time-trial: Bonus, if parcour is done fast. Endurance: Bonus, if parcour is done slowly. Demolition: Bonus, if many obstacles are destroyed. Dodg'em: Bonus, if few obstacles are destroyed. Survival: Bonus, if many enemies have been killed. Slalom: Bonus for flying underneath obstacles. The choosing line is only shown for a short time at the bottom. Races with the following area are rather simple: Shatter-Rock, Aquadrome, Grafiko. Also easier areas can be more difficult with high or even "packed" density than assumed diffult areas with the density "sparse" or "low". A higher bonus in one round results in a higher maximum energy in the next round. By clicking+left/right you can extend additional ordnance, but the glider is then slower in this mode and offers more contact surface. With up/down you can choose the flying height; on some terrain types you have to heave right after the start. If you want to have it simple, with many terrain types you can stay at one point, shoot yourself an aisle and then twirl one's thumbs in the following rounds. The enemies give notice of themselves by certain sounds. If you keep those in mind, you know where to move before the enemies appear. You need several shots to destroy Katerkiller, it loses one segment per hit. Flying over the "G"s earns money. Generally you should concentrate on collecting enough enery, to end the race is more important than bonus money or bonus points. The names of the months are: 1st Noot, 2ns Stynario, 3rd Cavery, 4th Masra, 5th Pinor, 6th Doona, 7th Coy, 8th Bart, 9th Thion, 10th Aramarn, 11th Praa, 12th Siro, 13th Tan and 14th Eriss. The first rounds of the final are even with slowdown in the emulator very difficult. The first obstacle on the final is counted as a portal, so you should heave a bit right at the start. If you want to have it simple, you can stay on many terrain types at one place (at the right border), shoot free a lane in the first round with glide mode fight and then in the following rounds twirl your thumbs while being in glide mode speed at full speed. However, on rare occasions you can still get caught by Katerkiller. 1570: "Graphically and concerning the sound it is a very nice game, but "only" a fancy racing game. I would have expected something else from the creator of Paradroid, but I was already not very enthusiastic about Uridium." 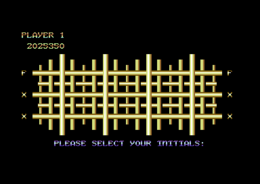 Robotron2084: "The game just teems with fancy graphic and sound effects but is a bit monotonous. If you liked Uridium, you will like this one as well. Baybrook's last really good game. 8 out of 10 points." TheRyk: "I think graphics and sound are okay, but despite the (at that time) new effects there is something as a clear style missing. Here and there it is for me personally too coloured or respectively optically too wild. But what counts is the gameplay. 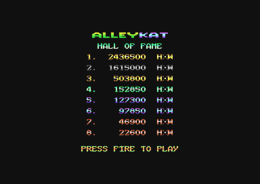 And as measured by that is Alleykat a very clean Shoot 'Em Up, which does not hide from the competitors and which friends of this genre should know. The idea of combining it with a racing game is something new. One can really give 8 out of 10." Klaws: "Graphics and playability leave nothing to be desired; especially the controls are done intuitively - although it first looks complicated in the explanations. Also a small strategic component is added, as you can ponder with which of the races you rather could climb the job ladder. On the contrary, the difficulty level is quite hard and the game hardly pardons a mistake. Sometimes you are lucky and you have saved enough money, so that a lost race does not immediately mean the game over. But most of the time it is really over and then you have to start completely anew. But I can give 8 out of 10 points." FXXS: "Technichally great, unfortunately too random (generation of tracks and appearance of enemies) and relatively little balanced (choice of races and score). When you get the rest by the third Katerkiller in a row in the last round, this is very frustrating, especially if the approach of deadly enemies has not been signalled due to another sound effect at the same time. Therefore there is not much long time motivation for me and I give 7 out of 10 points." 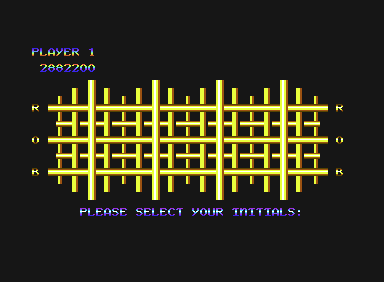 The game automatically recognizes if you use a C128, then uses the 2 MHz mode and with this you can make several shots at the same time and get a longer Katerkiller.